It wasn’t really a question whether Millie Bobby Brown would be back for Season Two of Stranger Things. The show’s creative team has been teasing Eleven’s return for quite some time—and there was no way they’d deny Brown a chance to build out the character after her performance earned an Emmy nomination, one of six for Netflix’s belle of the ball. Of course, though, it was at Comic-Con that audiences got a visual on Eleven, alive if not well in the hellscape of the Upside Down. The trailer is packed full of nostalgia, as you’d expect from Stranger Things—the arcade game Dragon’s Lair, a Reagan/Bush ‘84 sign, and a Ghostbusters containment unit with something trapped inside get prominent screen time. 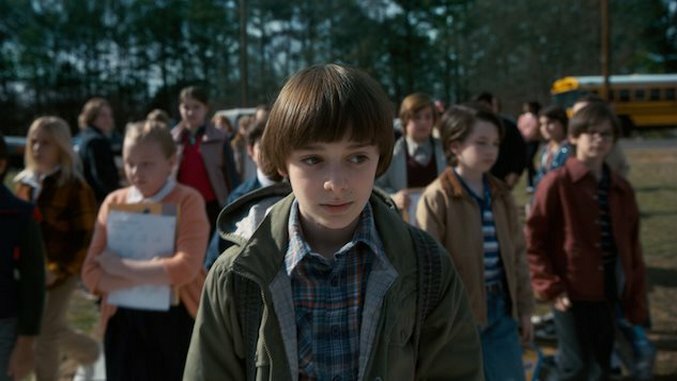 The creepy spoken segment of Michael Jackson’s “Thriller,” augmented by some spooky synth noises and drums, provides an ideal soundtrack for the dominant sense of unease, which centers on Will Byers (Noah Schnapp). It appears that he’s very much not okay, even a year out from his sojourn into the Upside Down; he’s having some bad flashbacks, to the point of going catatonic in the real world and getting tested by a menacing new doctor (played by Paul Reiser). And remember the portal Hawkins Lab ripped open between the two worlds to kick off the events of the series? It’s still very much open, and from the looks of the trailer, it’s the root of all evil. The panel also gave Stranger Things the opportunity to formally introduce three of Season Two’s new cast members. Aside from Reiser, these were Baker Montgomery and Sadie Cink, who play new Hawkins arrivals and siblings named Billy and Max. Montgomery spoke about working with the Duffer brothers to craft Billy, who will be the series’ first bona fide human antagonist—although he hinted at the possibility that this new character might be more of a monster than the Demogorgon ever was. And Wolfhard pulled faces at Cink as she danced around a question about her character’s role in Season Two, merely noting that Max has just moved from California. Cink also noted that she knew Gaten Matarazzo and Caleb McLaughlin from Broadway before she was cast in the show, so it will be interesting to see if that chemistry translates to the screen. Because it’s the chemistry between the kids that fueled much of the hype machine around Stranger Things, and that was on full display at the panel. Matarazzo, as usual, owned the spotlight. He told some of the afternoon’s best stories, relating the time a manic Parisian girl dragged him out of a van in a bear hug and the time a mother chewed him out at a restaurant for daring to finish his food before taking pictures with fans. But from Wolfhard and Brown giggling about unknown things off-mic to McLaughlin smiling sheepishly at just about everything, the panel served as a reminder that charming young actors can take a story from good to world-beating. It remains to be seen whether Season Two of Stranger Things will successfully address some of the first iteration’s problems, such as its female characters’ lack of agency and its excessive reliance on nostalgia. But at the very least, the Duffer brothers and their stable of adolescent stars should pack a thrilling Halloween punch. Season Two of Stranger Things premieres October 27 on Netflix.